I apologize for the lack in updating this past week. My husband’s best friend, his wife, and their 6-month old were visiting northern Michigan for a wedding and stayed with us for a few days. Combined with a few shifts at my 2nd job…I’ve been a tad busy! To the point where I haven’t done as much cooking as I normally would – but at least, I have cooked some. Here’s what I’ve done so far with Week 1’s CSA. A lot of my choices were made based upon recommended shelf life, so I still have a few things that remain. Kohlrabi (3 bulbs) – 1 down, 2 to go – I tried a slice of the vegetable raw, and wasn’t the biggest fan of it. I used 1 purple one in an Asian stir fry, along with tofu, snap peas, peppers, bean sprouts, garlic, ginger, a garlic scape, and a variety of different asian sauces & spices. I LOVED the kohlrabi in the stir fry, to the point where I’m considering blanching the rest of them to freeze, for future dishes. Swiss Chard (1 bunch) – Cooked with a garlic scape and some olive oil. I made sure to eat the chard first, as I read online that the taste of freshly picked swiss chard was incomprable to that which you find in your common grocer. I was surprised by the variety of color of the swiss chard; I didn’t realize that it came in colors other than red and white! The only downside to swiss chard, which I didn’t realize before, was that it cooks down a lot, even moreso than spinach. We both enjoyed the chard cooked this way, but it was disappointing that there really wasn’t a lot to eat once dinner was ready! Swiss Chard with Olive Oil & Garlic Scape. 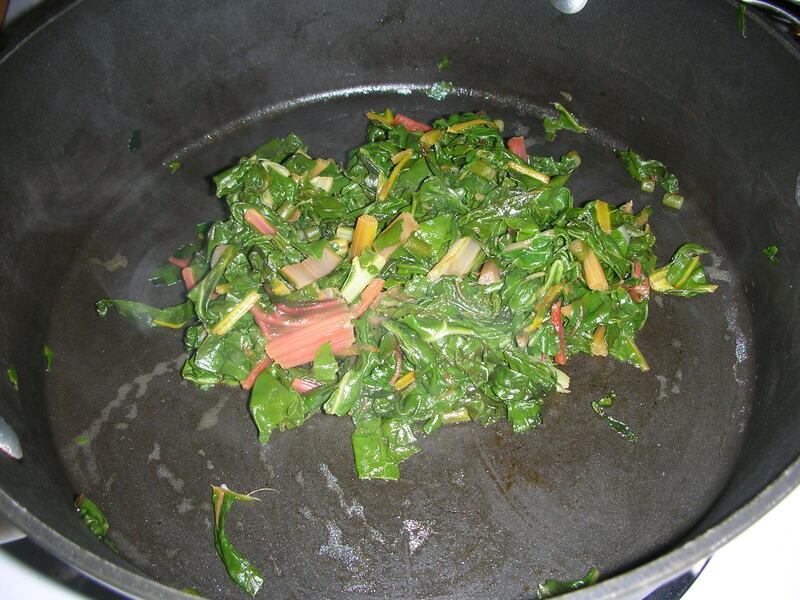 The pan was full when the chard was raw…look how much it shrunk! 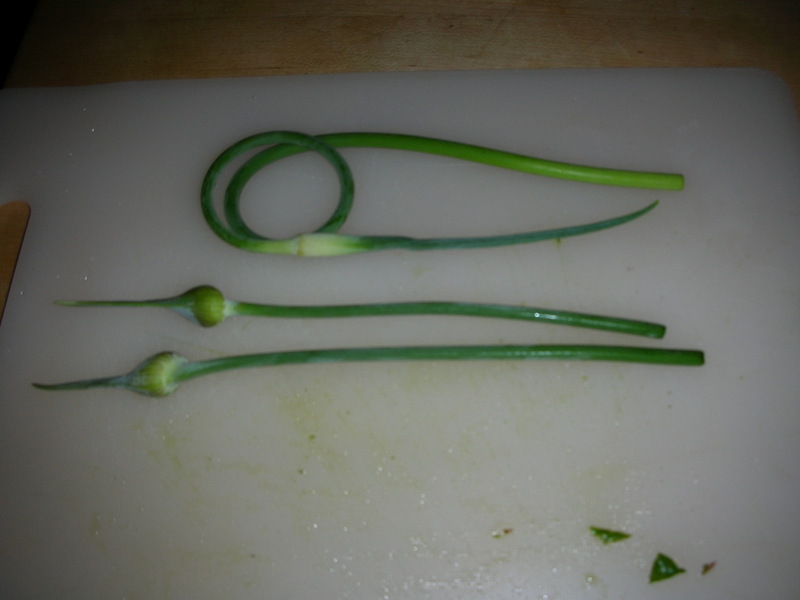 Garlic Scapes – Up until the past week, I thought that garlic scapes were sold at farmers markets for decoration, and not for eating. They’re the tops of the growing garlic plant, harvested once a year. Thanks to Kathy at the farm, I learned that they were used like green onions, but with a garlic flavor rather than onion. The verdict? Completely awesome! I’ve used these in several dishes over the week – stir fry, breakfast skillet, tacos – and I am now a true-to-form fan. Garlic scapes! Cut off & discard the flower, and eat! I’d consider Week 1 almost a success. I wish I had more time to use the vegetables, but thanks to research, I know that the ones that are left over will keep just a little longer in my refrigerator and they won’t go to waste! QotD: What’s your absolute FAVORITE type of salad? With our GIANT head of Romaine lettuce and some left-over lettuce from the CSA two weeks ago (apparently my family is suddenly not salad eaters?!?!?! ), I’ve been having a LOT of salad lately. I decided to try something a little new the other day and I ended up with a REALLY good salad. Inspired by our peanut rice noodle stir-fry the night before, I made a Thai peanut dressing, but thinned it out a little and ended up with something like a vinaigrette. I tossed that with the Romaine, shredded carrots, edamame, green onions (CSA! ), and it turned out a lot like the Thai Chopped Chicken Salad from Panera (except no chicken and no wonton strips). It was so good I made another one for my lunch the next day! That sounds fantastic! I may end up doing that with some chicken and the big head lettuce we got in our box this week, as I need a quick meal on Friday night before a gig. Is the dressing recipe in that email you sent me a while back? I still have it. You can find all kinds of Thai peanut dressing recipes out there. I didn’t use the one in the post (or any one, really), but you can try it. I usually just start with a tbsp PB, a dash of rice vinegar, soy sauce, garlic, squeeze of sriracha (if you have it, or just some red pepper flakes or something with a little heat), olive oil, sesame oil (if you have it), cilantro, ginger (powder or fresh), and maybe a squeeze of lime. You can thin it with more soy or just a bit of water. I don’t really thin it too much ’cause I like the thicker consistency. DEFINITELY TASTE IT BEFORE YOU PUT IT ON ANYTHING! A sauce too heavy on vinegar will ruin any dish, so this is one sauce I ALWAYS taste first. Good luck! Let me know if you try it and how it goes! Yum! Everything looks delicious 🙂 Thanks for linking up!